Toronto Maple Leafs coach Randy Carlyle is downplaying Nazem Kadri's demotion to the third line, but the young forward is still trying to earn his spot among the top six forwards this season. Leafs coach Randy Carlyle bristled at the notion Nazem Kadri has been demoted to the third line after a subpar performance when, in fact, that is exactly what has happened. And given the closeness in offensive ability between the Toronto Maple Leafs' top three centres - Kadri, Tyler Bozak and David Bolland - it is likely be that way most of the season. The three pivots are interchangeable parts. "I think you guys read a lot more into it...you always look for some form of negativity in one guy or the other," Carlyle said. "I don't look at it that way. We look at it as we have two very talented young players. One is more on the veteran side. I think there have been a lot of expectations heaped on [Kadri] to be a second-line centre here through the summer based on the history of his point production last year. "All those things are sitting out there and people are saying, 'He should be this; he should be that.' That is not reality when you put the skates on every day. Does he have that ability? Does he have that talent? Sure he does. He's a young player still trying to find his way in the NHL. Because we moved him for one night it seems like it is news." Kadri started the season hoping to be the Maple Leafs' No. 1 centre after finishing second in club scoring last season and signing a new two-year contract on the eve of the opening of training camp. Carlyle can say whatever he wants about the development of Kadri, but clearly he was not happy with the player's performance in Game 2 of the season. 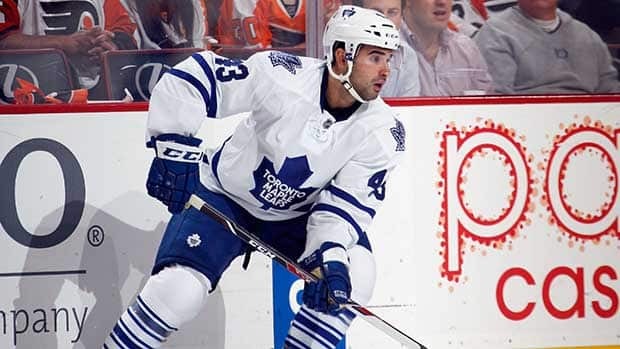 In the season opener Tuesday in Montreal, Kadri skated on the second line between Joffrey Lupul and Nikolai Kulemin. He played 23 shifts for 17:38 ice time. He started Game 2 in Philadelphia on the same line, but was benched for a while and then placed on the third line. He skated 17 shifts for 11:53 ice time. He clearly lacked the zip that he showed for most of last season and in Game 1. On Friday morning Kadri was back skating on the third line between Mason Raymond and Troy Bodie. It didn't help his cause that in stepping up to the second line Bolland scored two goals including the game winner. Kadri accepted his fate and knows he has to work hard to earn his playing time. He has said all along that the team has lots of quality down the middle and he expects it to be a real competition between all the centres. "That's just something that is going to happen; the juggling of lines," Kadri said. "I don't think it'll be the last time you see it this year. I think every guy is good on this team no matter what role they are given and it means you've just got to pick it up a little more to get that ice back." FRASER OUT: Defenceman Mark Fraser will miss at least 10 games with a lower-body injury. He has been placed on LTI. Winger Jamie Devane was recalled by the Maple Leafs from the AHL Marlies. UNDERRATED, BUT APPRECIATED: When it comes to penalty killing, few are better in the NHL than Toronto centre Jay McClement. In fact McClement led all NHL players in shorthanded ice-time last season with 175:59 in a lockout-shortened campaign. This year, in an 82-game schedule, he'll blow that number out of the water. In 13:09 of ice time in in Montreal, McClement skated 5:01 while the Leafs were shorthanded. In Game 2 it was 9:02 of his total of 18 minutes and 40 seconds. When the Maple Leafs signed McClement as a free agent two summers ago, some people thought, Jay who? Not Carlyle. Having coached in Anaheim previously, he saw plenty of the six-foot-one, 205 pound centre who previously played in St. Louis and Colorado. "When you coach against teams and the opposition coach puts a player out against your best players consistently and tries to match up, then you've got to believe that they trust that player," Carlyle said. "It is the same for Jay McClement and David Bolland. When I was in Anaheim both of those players were assigned the task of playing against Ryan Getzlaf and Corey Perry. "It gives you some insight as the opposing coach as to what they think about their players. Jay was a guy who was sent out to play against Getzlaf. He is an honest, hard-working guy." Just to be sure about McClement, Carlyle reached out to former Leaf Alex Steen who played with McClement in St. Louis. Steen gave his former teammate two thumbs up. RATING RIELLY: Nineteen-year-old defenceman Morgan Rielly is likely to make his NHL debut Saturday against the Ottawa Senators with Fraser on the sidelines. Recently Rielly was headed to the hotel he lives at from the Air Canada Centre when he heard two men, in their 20s and walking a few paces behind him, talking about him. "One guy asked the other what the Maple Leafs should do with Rielly," he said with a snicker. "I was in my street clothes so I guess they didn't know I was just ahead of them. The one guy said he thinks the team should put me back in junior so that kind of hurt my confidence a bit. If the guy had said the Leafs should keep me I would have turned around and thanked him, but since he chirped me, I just kept quiet." A short while later the gentlemen realized who was in front of them. "Are you Mr. Rielly?" one asked him. Rielly said hello and shook their hands. WINNING IS WINNING: It could be argued the Maple Leafs struggled a bit through their first two games and are 2-0 based mostly on the strength of solid play of their goalies James Reimer and Jonathan Bernier. Coach Carlyle isn't complaining even if he did practice the team hard Friday. "I like when we win," Carlyle said. "Any other coach would say the same thing. We're not going to criticize our group because we have done some good things. We've still got lots of work ahead of us. By no means are we happy and we probably never will be happy with the way we played in some of the games. "We have been sloppy and made mistakes, but so have the teams we have played against. We are still very much a work in progress." Mike Brophy Mike Brophy brings a wealth of hockey writing and broadcasting experience to CBC Sports, having covered junior hockey for 14 years before joining The Hockey News as its senior writer for 17 years starting in 1992. Most recently, the Burlington, Ont., native worked as a writer/commentator at Rogers Sportsnet and as co-host of The Power Play on SiriusXM. Mike has written four books, including My First Goal, featuring 50 players describing their first NHL goals.